Background: Multiple Sclerosis (MS) a progressive demyelinating disease of the central nervous system affects 2,300,000 people worldwide. Impaired balance is seen in up to 75% of individuals with MS which can lead to falls and further disability. Tai Chi, a form of martial arts, involves slow controlled movements and deep breathing. The physical benefits of Tai Chi include improved balance and flexibility. Methods: Participants were recruited from the surrounding metropolitan area. Inclusion criteria were: diagnosis of MS, ages 18-75, able to understand the informed consent, attend Tai Chi class, and attend a 60-120 minute testing session before and after the six week class. Activity was approved by the IRB at Texas Woman’s University. Pre-testing included completion of the intake form, Timed Up and Go (TUG), Berg Balance Scale (BBS), Five-Times-Sit-to-Stand (5TSTS), Dynamic Gait Index (DGI), and Activities-specific Balance Confidence Scale (ABC). Post-testing included the TUG, BBS, 5TSTS, DGI, and the ABC. The intervention was a 6 form Community-based Tai Chi program. Class was twice a week for one hour at a personal training gym. Results: Twenty-five participants completed the pre-testing. Only 15 participants returned for post-testing. All types of MS were represented. Data analysis using the Wilcoxon Signed Ranks Test identified significant improvement in the BBS (p=0.003), the TUG (p=0.018), and the 5TSTS (p=0.003). Conclusions: A community based Tai Chi program identified improvements in balance in the BBS, and TUG. Strength improvements were seen in the 5TSTS. Benefits identified warrant further studies using Tai Chi to improve balance and strength. Multiple Sclerosis (MS) is the most common progressive demyelinating disease of the central nervous system (CNS) affecting approximately 450,000 people in the United States, and 2,300,000 people worldwide . MS is commonly diagnosed between the ages of 20 and 50 but can also occur in children and older adults . Women are two times more likely than men to be diagnosed with MS, suggesting a hormonal relationship linking to increased susceptibility . MS causes inflammation in the CNS resulting in destruction of the myelin sheath of neurons causing the slowing or stopping of saltatory conduction and/or axonal loss impairing neurotransmission . Continuous insult to these unprotected axons leads to the formation of lesions (also known as plaques) specifically affecting white matter near the lateral ventricles, optic nerves, the corpus callosum, and the brainstem . The demyelinating process results in a clinical course that is unpredictable in its progression and severity. MS is medically managed with a variety of types of drugs. These drugs are known to slow down the progression of the disease or treat symptoms associated with the disease . The medical advancements in the treatment of MS allow People with MS (PWMS) to live normal lifespans with later onsets of disability . Despite advances in disease management, MS remains a progressive disorder and disability still occurs with time. People with MS exhibit signs and symptoms that fluctuate over time. Visual impairment is often the first symptom identified by PWMS. Common signs and symptoms include: fatigue (80%), bladder (80%) and bowel dysfunction, chronic pain (50%), cognitive impairments (50%), paresthesia, weakness, balance and sensory deficit, dizziness, vertigo, depression and mood swings, irritability, spasticity, respiratory problems, and decreased sexual responses . The symptoms associated with MS lead to impairments, functional limitations and challenges in daily life. Even early in the course of MS balance deficits have been identified . Further, impaired balance has been identified in up to 75% of individuals with MS throughout the course of the disease. Balance deficits from MS are associated with increased fall risk similar to that seen in older individuals. In a review of the literature Gunn et al. identified a 50% greater risk for falls in individuals with MS when compared to the general population. Balance deficits leading to falls can also lead to further disability in PWMS. According to Gunn et al. , falls occur more than 50% of the time in people with MS. In addition, individuals with MS have greater risk of fracture versus healthy individuals. Additional consequences of falls include loss of confidence and difficulty sustaining societal roles. As symptoms of MS such as weakness, impaired sensation, fatigue, visual deficits, and cognitive impairments increase so does the risk for falls. Medical intervention has provided an improved lifestyle for PWMS, therefore, identifying methods to further delay the onset of disability from the progressive nature of the disease is important. Studies have found exercise to be beneficial for PWMS in addressing impairments and functional limitations [8-17]. In spite of the identified benefit of exercise, participation in physical activity and exercise in PWMS remains low. Barriers to participation in physical activity include fatigue, perceived cost and access to exercise equipment, knowledge of trained personnel working with PWMS, and information about programs, transportation, and psychological factors . Kayes et al. described five core beliefs about activity in PWMS. These include the cycle of activity/inactivity, the line between benefit and harm, the idea that physical activity is a waste of time, physical activity makes MS worse, and the concept of use it or lose it. The beliefs identified in people with MS were based on the emotional responses associated with past experience with exercise and activity, state of the disease and illness versus wellness, and the What Ifs associated with exercise . It is paramount to identify methods of increasing activity and exercise in PWMS keeping these concepts in mind. Tai Chi is a form of martial arts originating in China and classified as a type of mind body exercise . This form of activity involves a moving meditation using slow controlled movements entwined with deep breathing. The activity is non-stressful and gentle in nature designed to rebalance the body’s healing capacity . The physical benefits of Tai Chi include improved balance control, flexibility, improved cardiovascular and respiratory functions, improved endocrine and immune functions . Tai Chi may also improve the perception of pain raising tolerance through the mind-body connection . Additionally, through the mind-body connection and breaking the pain cycle, there might be an improvement in neuroendocrine function, immune system function, leading to improvement in physical ability and quality of life . An additional benefit of Tai Chi is related to consistent practice which may increase levels of neurotransmitters such as dopamine, serotonin, nor-adrenaline, acetylcholine, GABA and endorphins and decrease levels of cortisol and adrenaline . The altering of neurotransmitters can lead to a reduction in stress hormones leading to improvement in mental health with a reduction in anxiety and pain . Tai Chi may improve postural control through movements that involve constant shifting of weight leading to improved muscle strength along with the mechanical loading and unloading of the limbs during the exercise . Further, emphasis on maintaining an upright and extended posture throughout the movements also improves balance. Tai Chi in a controlled environment may also mitigate the effects of fatigue and heat sensitivity commonly seen in PWMS. An extensive search of the literature identified two studies using Tai Chi as the intervention in people with MS. Using six sessions of guided Tai Chi supplemented by video and paper description of the movements, Mills et al. identified improvement in depression-dejection factor as measured by the Profile of Mood States (POMS), and an improvement in balance measured by the single leg test . In a second study Azimzadeh et al. 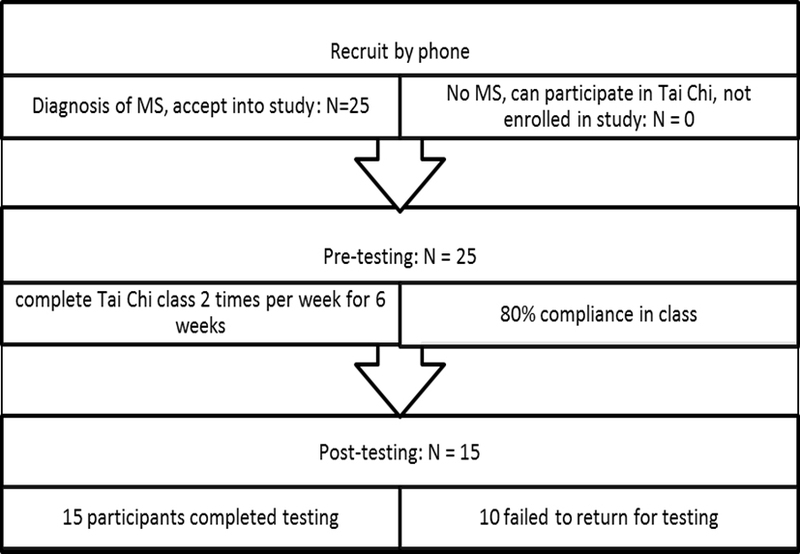 reported improved balance in women with MS who participated in a 12 week biweekly Tai Chi program. Despite the reported benefits of exercise, PWMS do not regularly engage in physical activity. Therefore, the purpose of this study was to determine whether a Tai Chi community-based program would improve balance and gait deficits and reduce the risk for falls in people with MS. A community setting was chosen to allow participants to complete the activity in a setting they might continue to use after the completion of the research project. Participants were recruited from the Dallas and Fort Worth Chapters of the National MS Society, local area neurologists, the MS walk in Addison, Mind Set Assisted Personal Physical Training, and Moonbridge Yoga studio. Inclusion criteria for the study were: definite diagnosis of MS, adults aged 18 to75, ability to read and understand the informed consent, ability to participate in the Tai Chi class, and ability to attend a 60-120 minute testing session before and after 6 weeks of class. The study was approved by the IRB at Texas Woman’s University and all participants provided informed consent prior to initial testing. Participants were screened by phone interview and completed pre-testing prior to the start of the Tai Chi class, and post-testing during week 6 of the Tai Chi class. Pre-testing consisted of completing of an intake form and administering outcome measures of interest, the Berg Balance Scale (BBS-measures static balance), the Timed Up and Go (TUG, dynamic timed balance measure), the Dynamic Gait Index (DGI, dynamic balance measure during gait activities), the Activities Specific Balance Scale (ABC-self report measure of balance confidence), and the Five-Times-Sit-to-Stand (5TSTS-measure of lower extremity strength). The reliability and validity for each measure is listed in Table 1. The intake form included type of MS, year of diagnosis, current medications, past medical history, current living status, use of assistive device, and employment status. The post-testing included the same measures used in pre-testing. Testing took up to two hours to complete. Participants completed a 6-week, community-based Tai Chi program led by Doctor of Physical Therapy (DPT) students. The DPT students were trained in the Tai Chi program by the principal investigator and provided a video for practice. The class was held twice a week for one hour each day and attendance was tracked at each class. The location of the program was a personal training gym, supported in part by the National Multiple Sclerosis Society (NMSS). This facility provides PWMS the opportunity to exercise in a safe environment with trained individuals who have a basic understanding of the disease process associated with MS. The setting is wheelchair accessible, cooled appropriately, with a large yoga room where the Tai Chi class was conducted. The Tai Chi program consisted of 6 forms: "Commencing", "Stroke the Horse’s Mane", "White Crane Spreading Its Wings", "Brushing the Knee", "Play the Lute", and "Step Back and Repulse Monkey" . These forms were done from either standing or sitting in a chair, dependent upon the participant's ability and tolerance. In the beginning sessions of the Tai Chi class, multiple rest breaks were allowed both for physical and cognitive breaks. All participants were learning the Tai Chi forms for the first time, so time was provided for questions and multiple demonstrations. By the end of the six weeks, the participants were easily completing all six forms without a rest break. Analyses were performed using SPSS (version 20) and a significance level of P <.05 was set for all analyses. Descriptive statistics (mean and standard deviation) were used to describe participants. The dependent variables in this study included the TUG, the BBS, the 5TSTS, the DGI, and the ABC. Non-parametric analysis using the Wilcoxen Signed Rank test was completed on pre and post-test measures secondary to small group size and a presumed non-normal sample. Twenty-five participants were recruited from the NMSS and MindSet Assisted Personal Training and signed the consent to participate form. All 25 participants completed the pre-testing session and began the six week Tai Chi class. Although class attendance during the six week Tai Chi class was excellent (80% attendance), only 15 participants returned for post-testing (Figure 1). A majority of the participants (mean age 59.3 ± 7.84) had relapsing remitting MS but 3 individuals had a progressive form of MS. Average length of time with MS was 21 years with a standard deviation of 10.3 years. All participants were either retired or on disability and not working. The majority of participants were female (73%) and the majority used an assistive device (66%). Data analysis using the Wilcoxon Signed Ranks Test identified significant improvement in several of the outcome measures (Table 2). Individuals in the Tai Chi program demonstrated improvement in the BBS (p=0.003), the TUG (p=0.018), and the 5TSTS (p=0.003). There was no difference from pre-testing to post-testing in the DGI (p=0.345) and the ABC (p=0.673). Tai Chi improved balance and LE strength as evidence by improved BBS, TUG and 5TSTS scores. A principle of motor learning in balance training is related to task specificity. Studies suggest that balance training is highly task specific . The six form Tai Chi used in this study focused on a static based balance activity which allowed the participants to begin the class seated in a chair. The progression of class moved from sitting to standing behind a chair emphasizing standing balance elements. Based on this style of Tai Chi changes in the BBS were seen along with improvements in the 5TSTS might be expected. The 5TSTS indicates improvement in lower extremity strength which was accomplished through the transition from sitting to standing during the progression of the class activity. Interestingly the TUG scores improved with a lack of improvement in the DGI scores. One aspect of the TUG is the sit to stand element. In this study participants improved their ability to quickly transition from sit to stand indicating a faster start to the TUG. The gait aspect of the TUG may not have changed, as indicated by the DGI, but the overall score improved secondary to improvement in LE strength. Based on lack of change in the DGI with improvements in the TUG score the assumption is made there was an improvement in the sit to stand component perhaps because of improved LE strength . Because the TUG measures the time for the entire task there is no way to verify the gait speed aspect of improvement. Given improvement in the 5TSTS the assumption of improved strength appears plausible. The TUG showed a statistically significant improvement after the six week Tai Chi class (p=0.018). A TUG of 13.5 seconds or greater indicates risk for falls in people with MS , and the average TUG score for the participants before the Tai Chi class was 49 seconds indicating an increased risk for falls. Clinically meaningful change would be a 24% decrease in time on the TUG and the group did not achieve that much improvement . The activities involved in the Tai Chi class were related to sitting and standing balance and weight shifting but not walking activities. These activities could lead to improved lower extremity strength without a corresponding change increase in gait speed. The improved lower extremity strength may have resulted in better the ability to transition from sit to stand faster. Therefore, the sit to stand component of the TUG might be the portion of the test that led to the significant change. The improved performance on the 5TSTS appears to support this idea. The lack of clinically meaningful change in TUG scores is probably related to the lack of walking or gait activities in the Tai Chi class. A measure of self-reported balance confidence, the ABC, did not improve in our participants. Nilsagard et al. reported people with MS who fell frequently had a mean score of 48 on the ABC. Similarly, individuals in our study also demonstrated low ABC scores (pretest = 45.2; post-test = 45.8). These scores suggest, like the participants in Nilsagard et al., that our participants were likely frequent fallers. The BBS scores support this conclusion (pretest = 37; post-test= 40.7). Another factor affecting balance confidence may be assistive device use. People with MS who use an assistive device are likely to have a lower score on the ABC . Sixty-six percent of the participants in this study used an assistive device. Multiple factors appear to play a role in the lack of improvement in the ABC in these participants [31,32]. An additional measure used to assess balance and risk for falls was the DGI. DGI scores did not improve following the Tai Chi class. The DGI which measures dynamic balance during gait has cut off of < 19 indicating increased risk for falls . The average DGI score before the Tai Chi class was 11.4 indicating fall risk in this group. Participants identified balance during walking activities as their biggest challenge. One reason for the lack of improved DGI score may be related to the static balance activities practiced during the Tai Chi classes. Again, improved balance, both static and dynamic, requires task specific training. The Tai Chi activities did not focus on dynamic aspects of balance. Therefore, one would not expect improvement in DGI scores. This study has several limitations making the results difficult to apply to the general population of people with MS. There were limited participants who completed the pre and post testing along with the Tai Chi class. A power analysis identified a sample size of 30 appropriate for determination of statistical significance. Although, 25 individuals completed the pre-testing and the Tai Chi class, only 15 completed the post-testing. People with varying levels of disability were included in the Tai Chi study. Some individuals walked independently, while others used powered mobility daily. The sample of people with MS in this study was variable which should lead to meaningful results; however, the study did not meet the 30 sample size minimum. The Tai Chi class was only six weeks in length and there was no long term follow up. It is impossible to state the long term effect of the Tai Chi class. Future studies might consider a longer class length of eight to twelve weeks with a four and six month follow-up. Many questions related to the benefits of Tai Chi for people with MS remain unanswered? Should the Tai Chi class offer advancing levels of challenge as individuals master the simpler six form class? How would adding additional forms affect individuals with cognitive deficits related to MS? What is the optimum length of time for a Tai Chi class to obtain maximum benefit in LE strength and balance? Future studies should include a larger sample size, additional forms for the Tai Chi program, longer duration of the program, a comparison group or control group. This study supports the use of Tai Chi for improvement in LE strength and static balance deficits in people with MS. The class used a simple six version form of Tai Chi that was easily taught to people of varying levels of disability from MS. The participants were able to practice Tai Chi in a seated position, supported standing (behind a chair), or independent standing. Many of the participants in this study who began class seated completed the sixth week of the Tai Chi class standing at least part of the 60 minutes. Physical activity is an aspect important to all lives in the maintenance of health. The Physical Activity Guidelines (PAG)  identifies for all people, even those with disability associated with neurologic diseases, 150 minutes of moderate physical activity is important in the maintenance of health. Individuals in this study participated in 120 minutes of moderate physical activity for six weeks during the Tai Chi class. With an addition of 30 more minutes of practice these people with MS could meet the minimum recommendation of the PAG. This study confirmed the benefit of Tai Chi in people with MS and also identified a safe mechanism for activity participation for the maintenance of health. The authors would like to acknowledge Travis Ehrhardt and Mind Set Assisted Personal Training for their dedication to people with MS and their support and assistance with this study. Rosenblat A (2016) Who gets MS? http://www.nationalmssociety.org/What-is-MS/Who-Gets-MS. Updated 2016. Accessed January 18, 2016. National Multiple Sclerosis Society (2015) What is MS? definition of MS. www.nataionalmssociety.org. Updated 2015. Accessed 06/29/2015, 2015. Roehrs TG, Karst GM (2004) Effects of an aquatics exercise program on quality of life measures for individuals with progressive multiple sclerosis. J Neurol Phys Ther 28: 63-71. ErtekIN Ö, ÖZakbaS S, IDIMan E, Algun ZC (2012) Quality of life, fatigue and balance improvements after home-based exercise program in multiple sclerosis patients. Arch Neuropsychiatry 49: 33-38. Mills N, Allen J, Carey-Morgan S (2000) Does tai chi/qi gong help patients with multiple sclerosis? J Bodywork Movement Ther 4: 39-48. Salem Y, Scott A, Belobravka V (2010) Effects of an aquatic exercise program on functional mobility in individuals with multiple sclerosis: A community-based study. J Aquatic Phys Ther 18: 22-32. Garofalo M (2015) Taijiquan 24 form. www.egreenway.com/taichichuan. Updated 2015. Accessed September 30, 2015. Physical Activity Guidelines Steering Committee. Physical activity guidelines. http://health.gov/paguidelines/guidelines. Updated 2015. Accessed 11/9/2015, 2015. Potter K, Allen D, Yorke M, et al (2015) Multiple sclerosis EDGE. www.neuropt.org. Updated 2012. Accessed 07/06, 2015. Rehab Measures (2015) Rehab measures. www.rehabmeasures.org. Updated 2015. Accessed 7/6, 2015. ©2016 Csiza L. This is an open-access article distributed under the terms of the Creative Commons Attribution License, which permits unrestricted use, distribution, and reproduction in any medium, provided the original author and source are credited. School of Physical Therapy, Texas Woman’s University, 5500 Southwestern Medical Center Dr, Dallas, TX 75235, Tel: 214-689-7719; Fax: 214-689-7703.